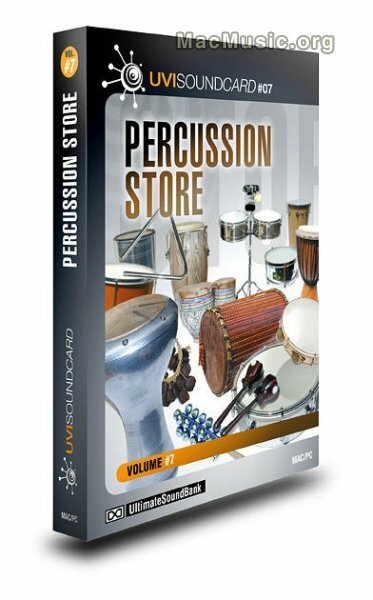 Univers Sons/Ultimate Sound has just released Percussion Store, a new collection of percussion sounds. Afoxe, Agogo, Bata, Bells, Bendir, Berimbau, Birdcall, Blocks, Bongos, Bonko, Cajon, Castanet, Caxixi, Chimes, Chocalho, Claves, Congas, Cowbell-Campana, Cricket, Cuica, Cymbals, Derbuka, Djembe, Dundun, Ganza, Guiros, Jingle Bells, Maracas, Moroccan Tabla, Ocean Drums, Pandeiro, Quinto, Rainstick, RecoReco, Repinique, Shaker, Shekere, Sistre, Sonnaille, Surdo, Tamborim, Tambourine, Tarol, The Blue, Timbalito, Timbau, Tom-Tom, Triangles, Tumba, Udu, Whistles, Wood Block, Yoruba Tamb. As usual the Ultimate Sound Bank team were really committed into recording quality: first they did use an excellent recording studio with a percussion expert sound engineer, and then use excellent gear: Brawmer and Neumann microphones, Manley, Fearn & Neve preamp and compressors, high end analog to digital converters and the best sounding soundcards in the market. Percussion Store is now available for $149 / €129, and includes the full version of UVI Workstation.